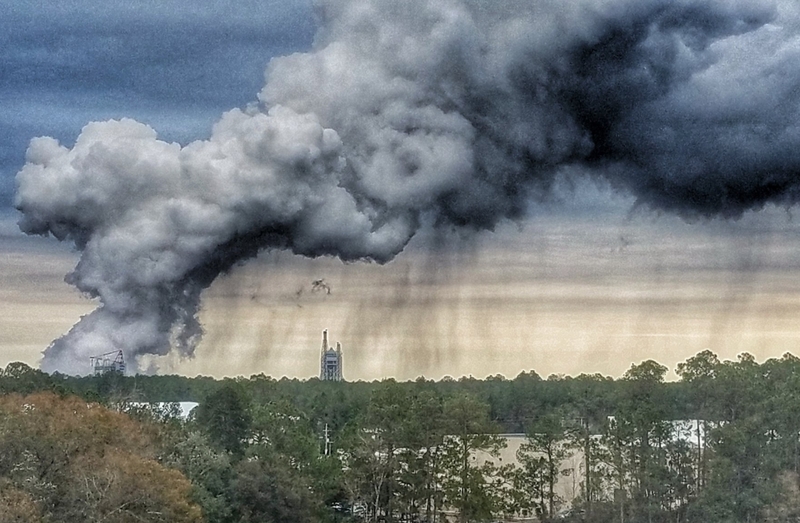 The test team of personnel from NASA, RS-25 prime contractor Aerojet Rocketdyne, and Stennis facilities contractor Syncom Space Services (S3) began another event-driven countdown on Tuesday morning, with ignition in the afternoon. Rather than targeting a specific time of ignition, the test started when all of the prerequisite steps prior to ignition are complete and the hardware and the people are ready. Ignition typically occurs in the mid-afternoon Central time and in this case it was 4:04pm local time. 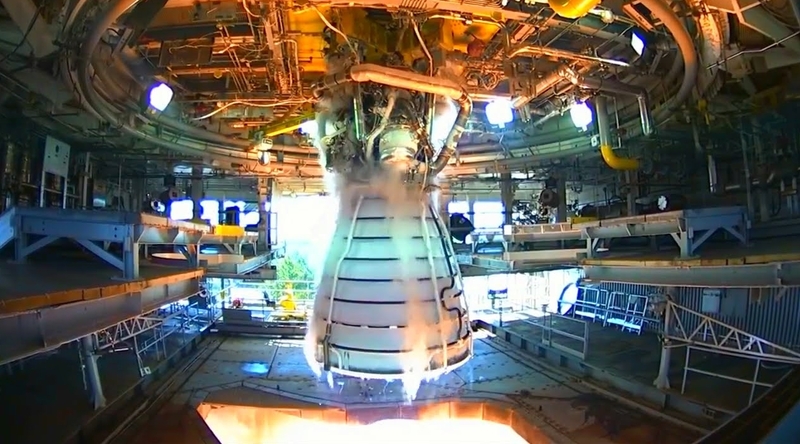 NASA will run out of existing RS-25 engines inherited from the Space Shuttle Program after four SLS launches and awarded a contract to Aerojet Rocketdyne to restart production of new engines for subsequent flights. The first production restart hardware to go into hot-fire testing, the beachball-sized pogo accumulator assembly was manufactured using additive manufacturing (AM) processes (also known as “3D printing”) that are hoped will help with the cost reduction goals of the RS-25 “production restart” program. This assembly, a development test unit, was built at Aerojet Rocketdyne’s facility in Canoga Park, outside of Los Angeles, using an AM process called selective laser melting (SLM). Although using new manufacturing methods, the pogo assembly retains the same form, fit, and function, which is to help to absorb and dampen the magnitude of oscillations that can start within the engine during mainstage operation. The accumulator is connected in the engine’s oxidizer system between the low and high pressure liquid oxygen (LOX) turbopumps. Benefield said that Tuesday’s test was planned to have a duration of 365 seconds. This appeared to be the case for the test. During the firing, he also noted that the engine will be throttled primarily at the high and low end of the production restart range of 111 percent and 80 percent of rated power level (RPL), respectively. E0528 will be throttled at 111 percent RPL for 177 seconds, and at 80 percent RPL for 148 seconds. The production restart engines will be certified to fly at 111 percent, with future plans to ground test up to 113 percent RPL. During a test, the engine in the A-1 test stand draws its propellants from “run tanks” built into the test stand, but the stand is also equipped with interconnected piping and other infrastructure like pumps that allow the run tanks to be backfilled with additional propellant from barge tankers that are docked there for tests. Although the test ran short, all of the objectives of the test were completed prior to the early cutoff. What was missed in the last approximately minute of firing was the normal, “stair step” throttle down to the minimum power level before shutdown. “We did not complete the typical power level ramp-down to 80% RPL for the planned cut-off; instead the engine was cut-off at [approximately] 108% RPL,” Benefield noted. Originally developed in the 1970s for the Space Shuttle Program when it was known as the Space Shuttle Main Engine (SSME), RS-25 hot-fire testing began at Stennis in January 2015, to demonstrate and certify engine operation at the higher performance levels for SLS. SLS is both physically longer and at times will accelerate faster during launch than Shuttle did, requiring different starting and running inlet conditions for the engines through powered flight. Four engines will fly in the SLS Core Stage, burning cryogenic liquid hydrogen (LH2) and liquid oxygen (LOX) fed to them from the stage’s propellant tanks. The engines will run at higher pressures and higher thrust than on Shuttle, and the propellant is also fed to them at colder temperatures. 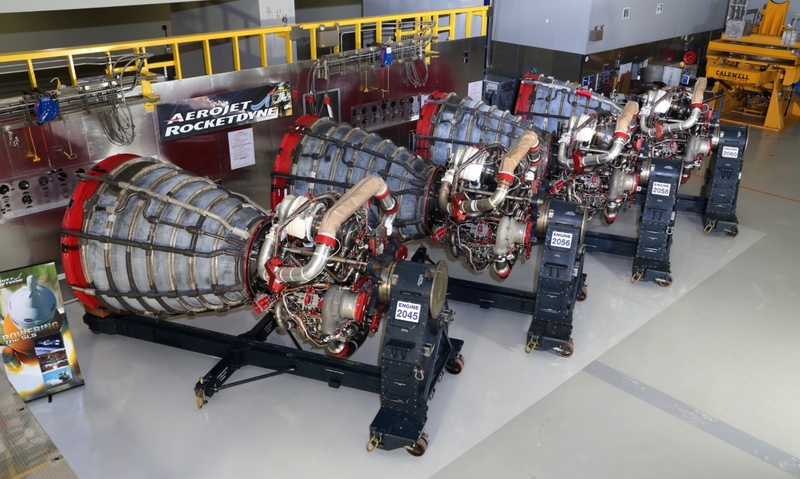 Although largely the same engine design and hardware, the RS-25 “adaptation” engines integrated a new control system for use on SLS, which includes new engine controller hardware and software. Hardware for sixteen SSME flight units remained after the Shuttle program ended in 2011, and those will fly in the Core Stage on the first four SLS launches. In addition to restarting supply chains, manufacturing, and production, a primary goal for the production restart program is a reduction in the cost to produce new units. Aerojet Rocketdyne is working with NASA to make further changes to RS-25 production restart units when they begin flying on SLS launches. 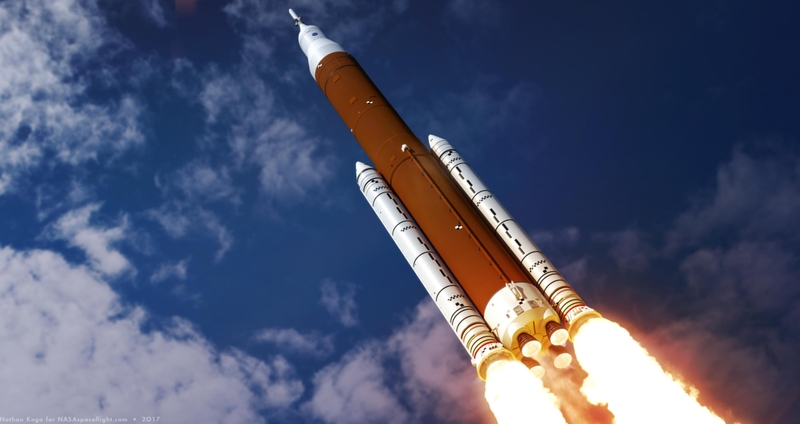 Although the changes are primarily aimed at cost reduction, the production restart design will also incorporate operational requirements changes such as increasing the nominal throttle setting from 109 to 111 percent RPL, which will benefit SLS performance. In addition to the primary test objective for the production restart program, the green run of the FM10 engine controller will also help to continue acceptance testing of the remaining component hardware needed for the sixteen adaptation engines that Aerojet Rocketdyne has in its facility at Stennis. Honeywell is continuing to build and assemble engine controller units and as they become available those flight ECUs will continue to be green run in the A-1 stand at Stennis. Ultimately, they will be installed on the existing, Shuttle-era adaptation engines to fly on the second, third and fourth planned SLS launches. The next hot-fire test is planned for early February.